Paragliding bag. Sac de parapente. NEW! I stopped jumping years ago, but I still fly so I took it up to show that it still works. See photos. 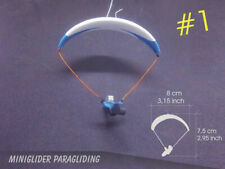 MiniGlider Paragliding mini Model. Inspired By Advance Sigma. Inspired by Niviuk Artik. Mini Glider Paragliding. It needed a new battery to function when put into storage. Note: we have not tested this unit since taken out of storage. Canopy colors are Black/Red/White/Red/Black/Red/White/Red/Black. 9 cell elliptical (responsive, not radical), very new and crispy. Manufactured 03/11, then my son joined the Army and not jumped since. ALL ORDERS ARE TRACKED. 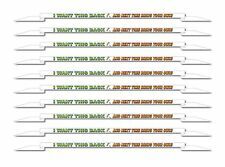 BUY 5M GET BONUS 1M FOR FREE. Il s'agit d'un impressionnant Parapente trucs super rapide sac. Si vous êtes un pilote vol libre et l'intention d'exercer votre harnais et l'aile, ce sac peut-être pas bien adapté. Fait de durable, nylon léger. Sterling silver Skydiving Closing Pin 925. Best gift is skydiving jewelry! 4 gr silver 925. the actual size of closing pin. Suited for paramotor, paraglider. "Chase Cam" "CC Spider v1 v2 v3", paramotor ". NEW chase-cam in plastic KIT "Spider v4" holder can be adjust looking front also on left/right. - mount suited for GoPro (all) models, GitUp, other sport cams. Inspired By Niviuk Roller. Mini Glider Paragliding. Features: Ultra smooth snag-proof design. BUY 3 AND GET £5 OFF! 2019. CONCERTINA BAG. Fast PARAGLIDING BAG, Schnellpacksack für Gleitschirm. Without paragliding logo ! Made of durable, lightweight nylon ( tafetta ). Products without paragliding logo ! NEW DESIGN 2019. Inside pocket for storage of loose ends. You can choose any Black, gray, blue, green, yellow, red, orange, white. Inspired by Niviuk Ikuma. Mini Glider Paragliding. Car Decoration. Date of manufacture: March, 1971. Serial number 2581. Part Number: 64E1209-1A. Open "T" steering factory modification. No pilot chute included. 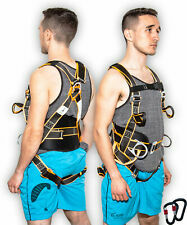 This is an ultralight harness for alpine hike and fly. 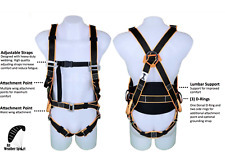 I bought this harness new and It's never flown. I've only used it for a few hours of kiting, ground handling practice. It's surprisingly comfortable for such a minimalist harness. Installed latest version of XCSoar or LK8000 or Top Hat- on your choice. Battery life more than 10 hours. Also you can plug in power bank. Device attached to the cockpit by velcro. UHMWPE Braided Line 1mm 350lb. Breaking Strength: 350lb /158kg. Dyneema is an UHMwPE (Ultra High Molecular weight Polyethylene), Known as the world’s strongest, lightest fiber, yet floats on water, Dyneema is an ingredient material in many of our highest performance ropes and is used across our range from kite lines to heavy lift slings. Great Peripheral Vision. 2 new skydiving or motorcycle goggles with clear lens. Anti-Scratch Coating. Double-Sided Anti-Fog Coating. Very good wing. The wing is crispy. Lines and canopy are in great condition. There is no problem flying with this wing. 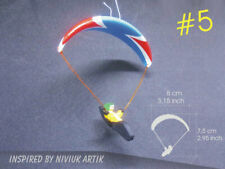 Notice: The first photo(main photo) is from "Axis paragliders" catalogue. It is not an actual photo of this wing. Russian UT-15 "paracommander" parachute system. UT-15 parachute system. 2 pilot chutes, sleeve, risers, main harness/container. No reserve parachute or ripcord. Note: Hang Gliding and Paragliding are forms of aviation which are considered hazardous sports with inherent risks. You must have proper instruction from a qualified instructor before undertaking any aspect of Hang Gliding or Paragliding. This is an excellent shape, albeit outdated 178sq ft 5 cell design. manufactured 09/1987. Raven3 parachute - 249 sq ft. made from F111 material. Originally manufactured as a reserve, and later used as a skydiving main. Parachute canopy. This is an older, but still solid wing. 7 cell canopy. Good for groundhandling and practice. Year of manufacture: 2004. Naked Pilot Weight: 62-87kg (137-192lbs). Strong MASTER 425 Tandem canopy. the canopy is in mint shape. This canopy was last factory recertified in 2012. As stated above, the canopy has reached end of life as mandated by the manufacturer. 425 sq ft of F111 nylon. Dolphin D2 skydiving parachute container for 170/160 canopies, fits 5'3" - 5'5"
Reserve freebag and reserve pilot chute. D2 size for up to 170 in main AND up to 160 reserve reserve. It's been living in a closet for the past 10 years :(. It's for the container ONLY. The sale is for the CONTAINER only, NO MAIN, NO RESERVE ! ). NOVA 120 skydiving parachute canopy - elliptical 9 cell. It is not to be used for skydiving ! Condition : The canopy is in mint, almost new shape. Zero Porosity material. The lines will be cut at the links :(. ). X228 (228 sq ft) skydiving parachute canopy - square 7 cell. F111 material. by Parachutes Australia. Parachute canopy. It's an older 30 year old canopy. It's still airworthy, just a bit old. red center lines. Ideal for beginners. Rising threshold: from 0.1 m/s to 2.0m/s. USB cable: included. Cockpit fixing: with velcro (included). Risers fixing: included. Online flightbook: included. Autonomy: >200h. Alfapilot XiHD has been replaced by new upgraded model the Alfapilot RS. Its electronic ink display allows perfect visibility under direct sunlight, even with polarised glasses. Better contrast, 40% more pixel density compared to the Xi version. Complete and in working order. Marked "PIONEER PARACHUTE CO. PARA-SAIL MANCHESTER CONN." "MFG 67". The buckles on the front are stamped "US 60B4323 CM 67". No rips holes or tears. Some wear, stains can be seen and some fading on the strap. It is very cool and the buckles all work. 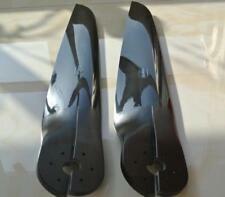 Can be used for ground handling paramotor training. Pioneer Aerospace Corporation is an aerodynamic deceleration manufacturer. Pioneer has designed and manufactured parachutes and parafoils for numerous NASA missions. 1965, "Astronaut Thomas Stafford" parasail’s over Galveston Bay wearing a parasail harnessed space suit, helmet, and carrying water survival gear hanging below him. Strato-Star main parachute canopy by Para-Flite. The canopy is in very nice shape. F111 material. white canopy with blue ribs. canopy is in great shape and was only used as a reserve. MODEL #: M1. MANUFACTURER: COOKIE.